OMG Posters! » Archive "Mi Amor" Letterpress Art Print by Jeral Tidwell - OMG Posters! Jeral Tidwell only does one letterpress print per year, so when he does, you’d better pay attention. 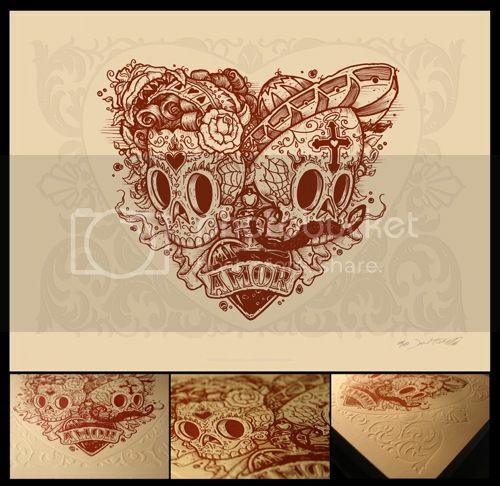 An ode to Valentine’s Day, “Mi Amor” is a 12″ x 16″ letterpress print, has an edition of 100, and costs $40. Visit Humantree.com. Awesome imagery and the blind embossing sealed the deal… Had to pick one up for my lady. SWEEET!!!!! Locked it in already. One of his best yet. Consider this one SOLD OUT! I really dig his limited letterpress/embossing work…so nice…dragon calendar is cool too…I like when Artists go out of their norms and comfort zones and create stuff you would never expect them too.